* 본 제품은 기존 SMARTer® PicoPLEX® DNA-Seq Kit (Code R300381)의 업그레이드 버전 제품이며, indexing primer kit가 포함되어있지 않습니다. SMARTer® PicoPLEX® Gold Single Cell DNA-Seq Kit (이하, PicoPLEX Gold kit) 은 Single cell로부터 고품질의 Illumina® DNA library를 제작하는 제품이다. 본 제품에 적용된 SMARTer® PicoPLEX® Whole Genome Amplification (WGA) 기술은 정확성과 재현성 높은 copy number variants (CNVs), single nucleotide variants (SNVs), indels, small structural variants를 검출 가능하다. 특히 새로이 업그레이드된 본 제품, PicoPLEX Gold Kit은 SNV 검출로 잘 알려진 Multiple Displacement Amplification (MDA) 기술을 상회하는 성능을 나타낸다 (Highly reproducible and accurate single cell whole-genome amplification using next-generation SMARTer PicoPLEX technology). PicoPLEX Gold Kit에 적용된 SMARTer® PicoPLEX WGA quasi-random priming 기술은 fixed 또는 unfixed single cell의 CNV 검출을 위한 Whole Genome Amplification (WGA)의 전 세계적인 Gold Standard 기술로 알려져 있다. PicoPLEX 기술은 본디 염색체 이수성 (aneuploidies)과 CNV 검출용으로 개발되었지만, 효소, Primer, 프로토콜 등의 개량 및 최적화를 통하여 CNV, SNV, indel, small structural variant 검출에 대한 sequencing coverage, 균일성 (uniformity), 정확성 (accuracy)을 대폭 향상시켰다. 그림 1. SMARTer PicoPLEX Gold Single Cell DNA-Seq technology. Panel A. Schematic depicting the simple, four-step PicoPLEX Gold workflow with minimum hands-on time. Panel B. Schematic illustrating the PicoPLEX Gold chemistry. Cellular gDNA extracted in Step1 is used as the template for multiple cycles of quasi-random priming and linear amplification followed by exponential library amplification. 그림 2. Real-time analysis of library amplification using the PicoPLEX Gold Kit. 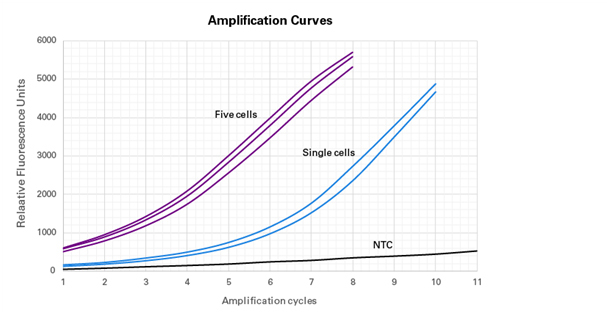 A typical real-time amplification analysis of libraries prepared with PicoPLEX Gold Kit using triplicates of single (blue) and five (purple) GM12878 cells, relative to the NTC (gray). Results were obtained using the CFX96 Touch Real-Time PCR Detection System with EvaGreen and fluorescein as the dyes. 그림 3. Key features of PicoPLEX Gold: comprehensive coverage, high uniformity, and reproducibility (in comparison to QIASeq FX). Panel A. A log-log plot showing the number of bases covered at various depths of sequencing (~30M read pairs, PE 2 x 150bp). The coverage of PicoPLEX Gold was similar to QIASeq FX (MDA) at lower depths and greater at higher depths. Panel B. Examples of the coverage patterns of PicoPLEX Gold and QIASeq FX in gDNA (NA12878) and single-cell samples (GM12878) for a 75-kb window (chr2). MDA has a higher propensity to leave large gaps in the genome, whereas PicoPLEX Gold has a more uniform coverage. Panel C. The reproducibility of coverage evaluated by comparing total reads in 100-kb bins. The consistency of the total reads in each window from the two single-cell libraries is significantly higher for PicoPLEX Gold (left), both in comparison to QIASeq FX (right) and to other technologies in the market (data now shown). 그림 4. 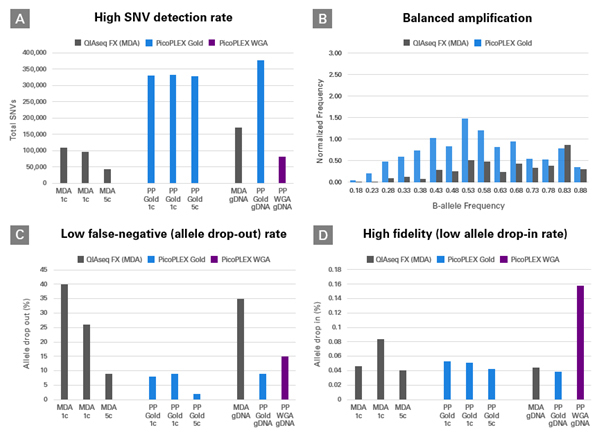 High-quality single nucleotide variant (SNV) detection with PicoPLEX Gold. Panel A. Comparison of SNV-detection rate between QIASeq FX (MDA), PicoPLEX Gold (PP Gold), and PicoPLEX WGA (PP WGA) kits from one cell (1c), five cells (5c) or 15 pg of NA12878 gDNA inputs. Single and five cells were sequenced to a depth of ~35M read pairs, and gDNA samples to a depth of ~40M read pairs. The high fidelity and robust coverage of PicoPLEX Gold (blue bars) provide a clear advantage in detecting a greater (~2-9 fold) number of high-quality SNVs compared to QIASeq FX (gray bars) and PicoPLEX WGA (purple bar). Panel B. The symmetric distribution of the B-allele frequencies for PicoPLEX Gold (blue bars), centered around 0.5, indicating a balanced recovery of both alleles. PicoPLEX has better allele balance compared to QIASeq FX (MDA) (gray bars). 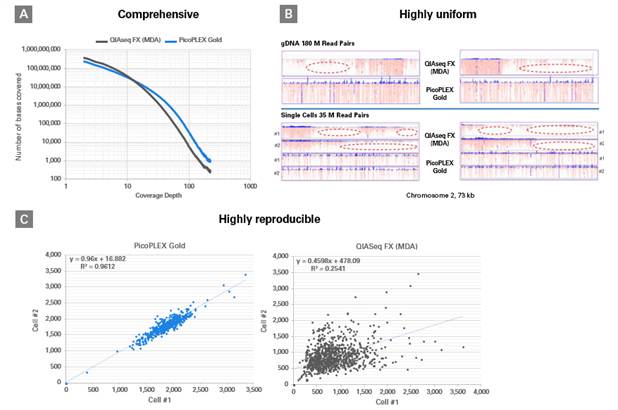 Panel C. Unbiased amplification of PicoPLEX Gold results in the lowest allele drop-out (false-negative) rates among all single cell library-preparation technologies tested. Panel D. High fidelity of the polymerase used in PicoPLEX Gold Kit (blue bars) leads to minimal allele drop-in rates that are comparable to QIASeq FX (gray bars) and significantly lower than PicoPLEX WGA (purple bar). 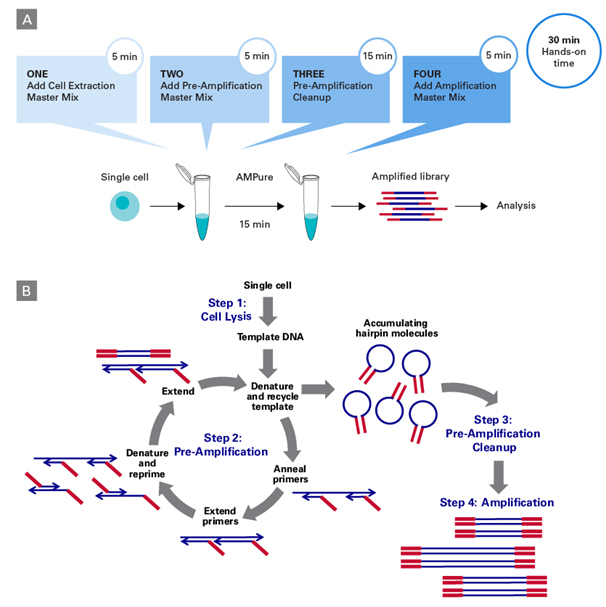 Single-cell NGS library prep for SNV and CNV det..